Last month, the prime minister of India officially announced the death of Rs 500 and 1000 notes. After the PM’s announcement of demonization, people are visiting banks often to deposit their money. Depositing money is easy, but withdrawing it is a meticulous task because queues in front of bank’s cash counters and ATMS are longer than they used to be before. Removing money from the nearest ATM is faster than removing money with a cheque. Demonetization of the two most widely used notes has left ATMs in metro and non-metro cities deprived of cash. Most of the ATMs across India are not functioning. In my city, the shops where banks have set up their ATM are shut. The bank executives add cash to ATMs nearby you once in a blue moon. To help you in finding such ATMs in real-time, we’ve shared some great apps. Instead of wasting time and money in paying a visit to the nearby dead ATM, use the applications we’ve shared. The app is reliable as it is launched by India’s 2nd largest classified website Quikr. It is easy to use. To find ATM with the CNC app, users must enable the data connection on their phone and enter their PIN code in the text box displayed on the main UI of the app. Once you provide the correct PIN code, tap on the Find Cash button. Now, you’ll see a list of available ATMs that are closed, busy or allowing users to withdraw money. The app has a function to locate the working ATMs on Google Maps so that you can quickly reach to the machine and remove money. You must reach the ATM quickly as it may run out of cash at any moment. The CN app from Quikr lets users create alerts. This is a smart feature. If you use it sensibly, the app will save your time. 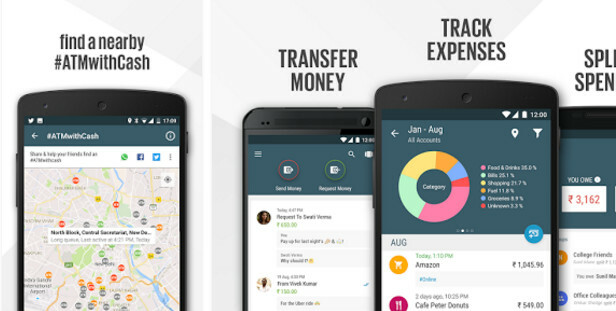 Walnut is an expense tracker app that allows you to find nearby ATMs. To use its ATM finder tool, you must verify your phone number with the Walnut app. Here’s a brief tutorial which explains the steps for the same. Install and run Walnut on your phone. The app will prompt you to give it permission to access your SMS and contact list. Once you grant the permission, the app scans your messages to get details on the bank transactions. Once your Walnut account is setup, tap on the menu icon located at the top left corner of the main interface and choose the “Active ATM Around” option. Finally, give the Walnut app the permission to detect your location. Once you do so, the app highlights nearest ATMs with cash on the Google Maps. 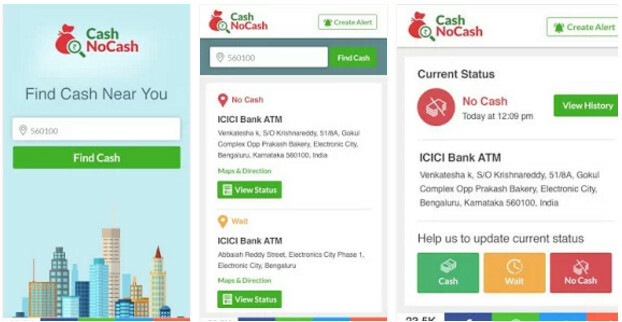 CMS ATM status is a web-based application that enables users to find ATMs that are allowing people to remove 100 or 2000 Rupees notes. The tool is easy to use. You have to select the state and city. The app will show a list of nearby ATMs along with their full address. The tool has been launched by one of the largest cash management firms in India. Hence, the details of ATMs you’ll find with it are correct. Conclusion: Demonetization is a positive step taken by the Indian Government to reduce the circulation of black money. We cannot guarantee that the apps will help you to find a functioning ATM but you should give them a try. As only a 10% to 20% of ATMs are letting users withdraw the new 2000 Rs notes, you have no other option than standing in a long queue. You may have to wait for up to 2 hours.